A lamb's tongue is a decorative profile carved into a workpiece which eases the transition between a chamfer and a square corner. 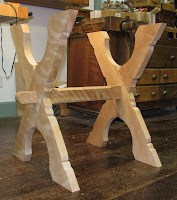 The original sawbuck table does not use a lamb's tongue, but a simple curve, on the stretcher that links the two leg assemblies. One of the things that attracted me to this project was all of the details—ones that I have never tried before—that were applied to what at first glance appears to be a very simple table: eased chamfers, tusk tenons, sawbuck legs, and an angled drawer. First, I made a jig so the corner I was working on would face up and so I didn't have to use clamps to secure the stretcher to the workbench. It is entirely possible to make this design element with just a straight chisel. Maybe that's why we see this feature in so many antiques—it's a subtle, yet distinctive, and easily created element. To use a chisel, carve the convex portion with the chisel bevel up. Use it bevel down, and lever the chisel in a scooping motion for the concave portion, working from both sides of this section to avoid tearout. Scoop down into the "valley" and feather the area where two sides of the valley come together. I had an easier time accomplishing this with a gouge.